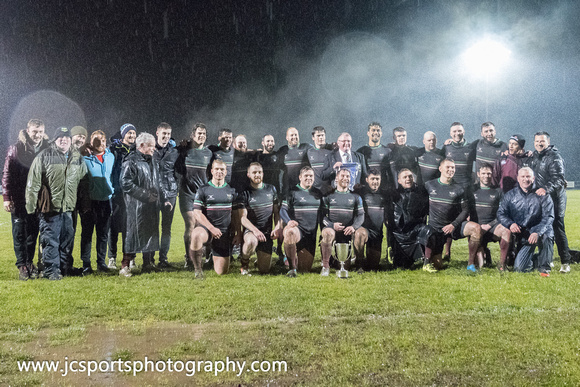 A performance full of character and determination, featuring some brilliant counter-attacking rugby and no little skill in awful conditions saw DLSP FC lift the Spencer Cup at Kirwan Park last night in front of a delighted crowd who braved the worst of the elements to cheer the team to victory. Salmo were quick out of the blocks and registered early scores from Ian O'Connor and Richard Nunstedt to give the home side a 12-0 lead after just 8 minutes. As we know all too well however, Ashbourne are a quality side and they hit back with two of their own before a third score from Martin Smith saw us turn around 17-14 in front with the match finely poised. A brilliant break from our 22 by Michael Cooke released Alejandro Castro to score our fourth try with Ian Burke converting via the woodwork to move Salmo into a 24-14 lead early in the second half. Showing no intention of lying down, Ashbourne's big pack started to really turn the screw in the scrum and earned several penalties which pulled them back to 24-20 and then rumbled over to take the lead for the first time in the 55th minute: 24-27. Just as the nerves were starting to fray, a lovely one-handed offload from Kevin Burke sent Kevin O'Neill clear and he showed great composure to outflank the Ashbourne cover and dive for the corner to give Salmo a narrow 29-27 lead and turn the tide back in the home side's favour. As we headed into a nail-biting last 15 mins, Anthony Barry took a great line off a lineout and released Matt Curran to register the game-changing score and move the scoreboard on to 36-27. Morgan Merriman won a crucial turnover as Ashbourne looked to get back into the game before, off a retreating scrum, the ball was shipped out to Matt who chipped ahead for Kevin Burke to run half the length of the field and win the race to touch down to put the result beyond any doubt, much to the delight of the home crowd: 41-27. Director of Rugby, Norman Byrne, said after the game: "This match was a fitting conclusion to a great second half of the season for this group. 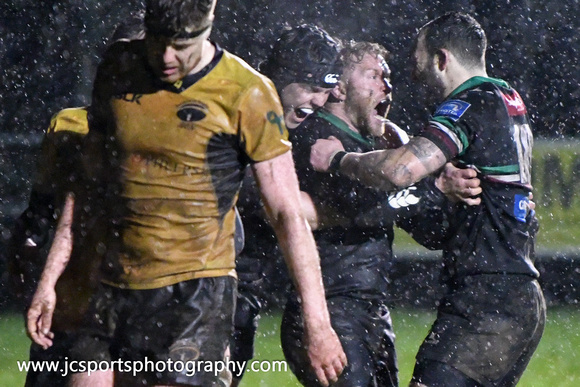 What was most pleasing for me was the positivity throughout the game tonight - the lads kept playing their smashing brand of rugby, despite the conditions, and defended with their customary character and commitment. It was absolutely down to the “Together We Are Stronger” approach espoused by Massey. "It’s opportune to acknowledge the integral support that has been given to this group by a number of individuals over the season, and thank them massively for that support: Lar Hudson, Declan O’Neill, Pat Costelloe, Ray Carey and Ciaran Shields in particular have worked tirelessly over the season doing all the work that allowed the players to focus on their roles. "And to the players: a huge well done and thanks for all their efforts - not just the 20 that had the privilege of representing the club in the final last night, but each and all of them who contributed so much throughout the season." A very proud club President Declan Farrelly added: "Last night's win was a culmination of hard work by the coaches, players and management in the second half of the season. 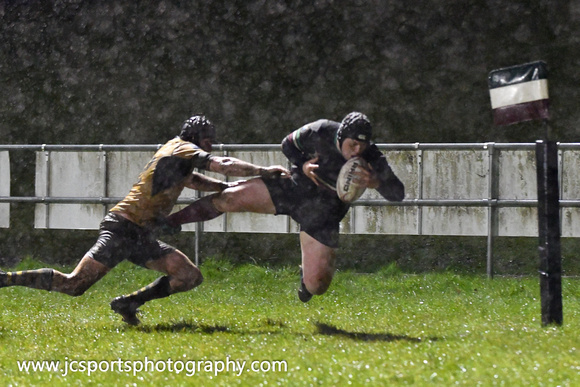 There was some fantastic rugby played in challenging conditions and we now need to take this into next season." It's only fitting that the final words on the night should go to our inspirational club captain Matt Curran who led his team magnificently as ever: "It was fantastic to finish this season on a high note. I’m tremendously proud of all the work put in by the entire squad which was reflected in the results in the later half of this season. Yesterday’s game is a simple indication of the potential our club has for the future. Finally, on behalf of all of the players, I’d like to thank those who have supported us regardless of the circumstances, it did not go unnoticed. Looking forward to starting the preparations for next season. #Salmofamily"